From basic to targetted, multivitamins come in many forms. Some may contain too much, or too little of needed nutrients. 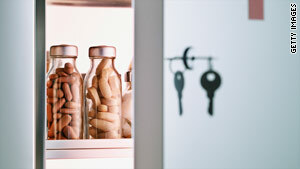 (Real Simple) -- In this day and age of food-on-the-go, supplements can add much-needed nutrients to your diet. But a walk down the vitamin aisle at any store could very well make your head spin. Here's a breakdown of several of multivitamin options. What they are: One-pill wonders that offer 100 percent of the recommended daily allowance (RDA), as suggested by the Institute of Medicine of the National Academy of Sciences, for many important vitamins. Benefits: They give you much of what you need in a day, including vitamins A, C, D, and E, B vitamins, and folic acid. Bonus: You have only one tablet to remember to take and swallow. Try One A Day Essential Multivitamin ($10 for 130 tablets, drugstore.com). What they are: Vitamins combined with powdered whole foods. "The manufacturers basically break down vegetables, fruits, and other food ingredients, add vitamins, and formulate that into capsules," explains Preeti Kulkarni, a naturopathic doctor in Los Gatos, California. Benefits: Less chance of stomach upset. "Since you're combining the vitamins with real food, they will be absorbed better and shouldn't cause gastric distress," says Kulkarni. In fact, it's even OK to take this kind of multi on an empty stomach. Try New Chapter Organics Only One ($50 for 90 tablets, newchapter.com for stores). Keep in mind: Despite the name, the vitamins you're getting aren't necessarily more natural; often they're the same synthetically produced versions as in basic multis. What they are: Single pills in a form you don't have to swallow whole. Benefits: Not having to force down large pills, which is a boon to those who have trouble swallowing tablets or who experience stomach problems when they do. Try Centrum Chewables ($7 for 50 tablets, drugstore.com). What they are: Souped-up multivitamins that contain larger amounts of nutrients that many women require. Benefits: They help you get the RDA of such vitamins and minerals as folic acid, calcium, and iron. Because iron can irritate the stomach, though, be sure to take these vitamins with a meal. Try Nature Made Multi for Her ($11 for 90 tablets, walgreens.com). Keep in mind: These formulas come in age-specific varieties, too. Ones for women over 50, for instance, may contain higher levels of vitamins C and E and less iron. What they are: Pills formulated for a specific population, such as pregnant women or those worried about a particular condition (like heart disease, osteoporosis, or eye health). Benefits: Certain people require more or less of certain nutrients. Pregnant women, for instance, are advised to take more folic acid to help prevent birth defects. Consider Twinlab Pre-Natal Care Multi Vitamin ($26 for 120 capsules, vitaminshoppe.com). Keep in mind: Some specialty multis (such as those touted to help joints) don't have substantial science behind them. Although they're probably not harmful, talk to your doctor before taking them. What they are: Drink mixes you stir into a liquid. Benefits: Often just one heaping tablespoon contains the vitamins and minerals that you would get from several pills. "Tablets contain fillers and binding agents that the body has to break down before the nutrients can be absorbed," says Kulkarni. "Powders don't require these." Try All One Original Formula ($48 for a 30-day supply, all-one.com). Keep in mind: Many powders have a bitter aftertaste, says Gidus. Mixing them with juice (not water) may help. Or try blending them with yogurt and fruit to make a smoothie. What they are: Individual daily packets that hold several pills designed to work together. Benefits: You can get higher doses of vitamin D, calcium, and omega-3 fatty acids, which are often not present in basic multivitamins. Try GNC Wellbeing be-Wholesome Health & Beauty Vitapak ($60 for 30 packs, gnc.com). Keep in mind: Some have megadoses, which in the case of vitamins A, D, and E can be toxic, says Davis Liu, a family physician in Roseville, California. Check the website of the Institute of Medicine for the maximum levels of vitamins and minerals that can be safely consumed.